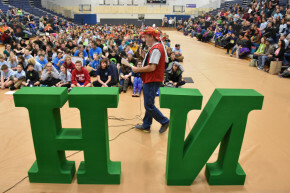 This Saturday, 90 teams – some 600 students from around the state will converge on Nashua High School South as the teams compete in future of work skills including creativity, collaboration and problem-solving skills in STEAM and service learning Challenges at NH Destination Imagination State Finals. Science, Technology, Engineering, the Arts and Math, as well as service learning are the core areas Destination Imagination, or “D.I.” Challenges. These teams advanced through regional tournaments, and over 230 teams statewide. Top scoring teams in each Challenge and age level will qualify to attend Destination Imagination Global Finals in May in Kansas City, MO.